Our last full day in Bruges and we decided to do as the locals do – get on our bikes. A cycle to Damme was the plan, grey skies and plenty of clouds did not deter us, in hindsight that was actually perfect cycling weather. We found a bicycle hire place in Bruges near the Conference Hall, there is no end of choice, this was just the first one we came upon and we booked up for half a day. The cycling was a breeze – flat, easy and right up my street. The hardest part of the whole day was dragging those bikes up from the underground storage area. 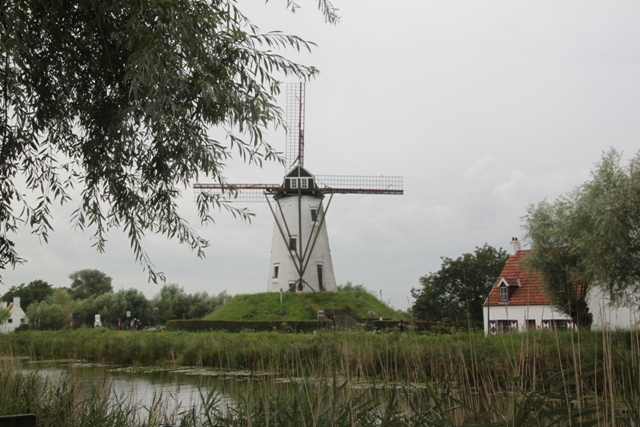 Damme is 6 miles outside Bruges, a historic and pretty little village in its own right. 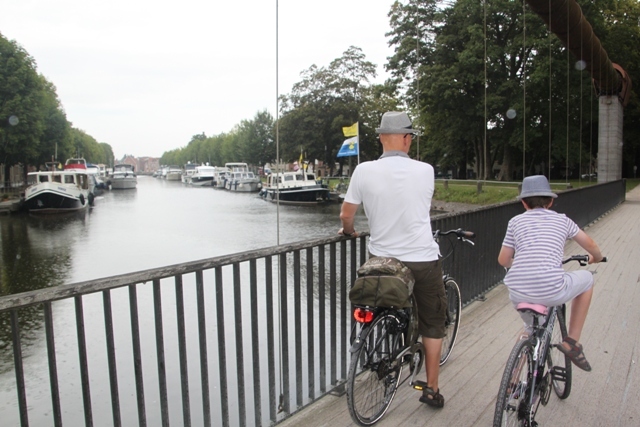 We pedalled out of Bruges on a wide cycle track which took us past the railway station, over a bridge and out of town. A couple of road crossings to navigate but it was mainly very safe and carefree. 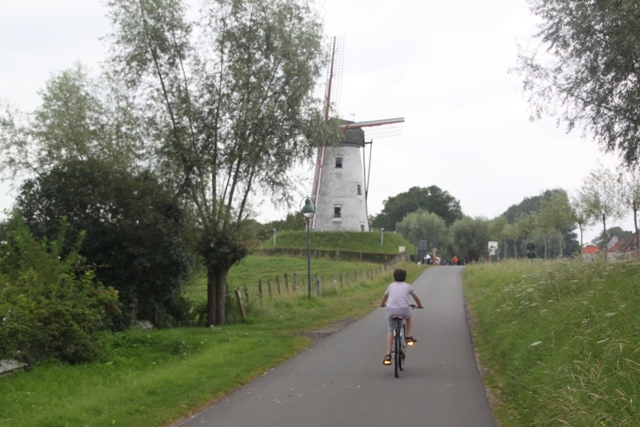 Soon we were on a flat canal path, the odd windmill looming on the horizon made Son very excited. I loved the bikes – so comfortable and a joy to ride. 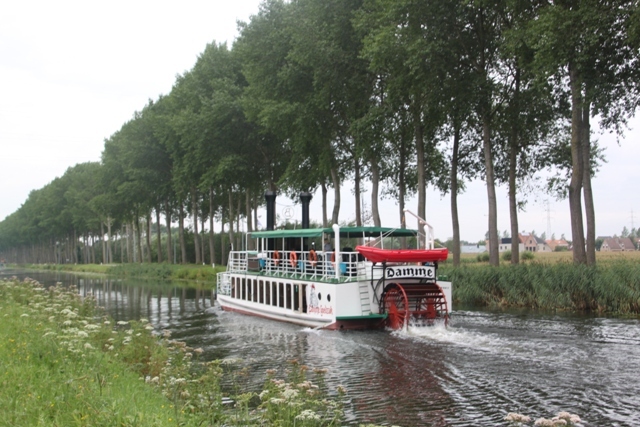 The poplar lined Napoleon Canal that connects Damme and Bruges is perfect for cycling and ideal with children. Traffic-free and not at all busy, you don’t have to stress or worry at all. 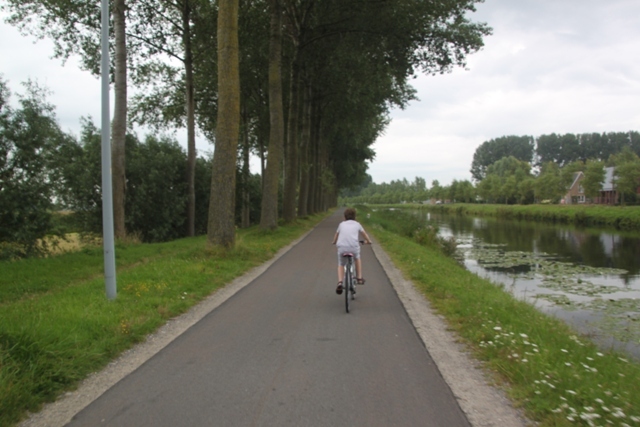 We cycled up towards Damme on one side of the water and back on the other. Both tracks were peaceful and quiet, the entire ride to Damme and back took about 90 minutes. Arriving in Damme it started to pour with rain, we chained up our bikes and promptly found a lunch spot. Huddled over Croque Monsieurs we waited for the weather to clear. Food and drink in Damme was a bit of a bargain compared to Bruges as we were pleased to discover. Rain over we explored a little on foot. This tiny place was once Bruge’s outer harbour and seagoing ships unloaded their cargoes until the Zwin outlet silted up in 1520. As a fan of the BBC drama “The White Queen” focussing on the relationship between Edward IV and his commoner wife Elizabeth Woodville I had an extra reason for wanting to visit Damme – several scenes were filmed in the 15th century town hall in the main square. 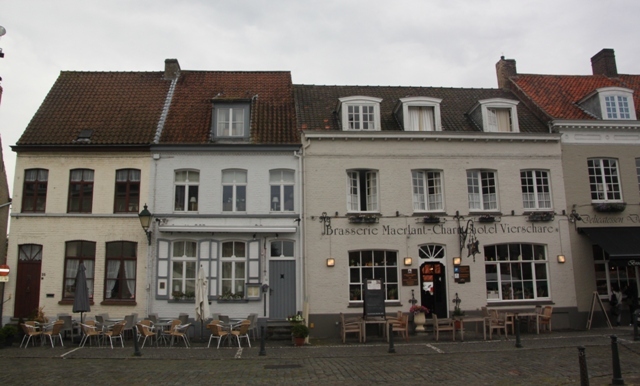 We ambled around the few streets that make up Damme. Pretty and with some intriguing art work here and there it is a pleasant place to stroll for a little while. Soon it was time to get back on our bikes and cycle to Bruges again. 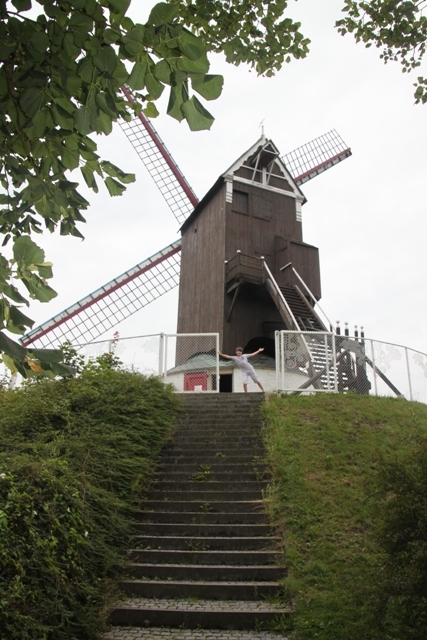 Exercise, scenery and sightseeing – the perfect last morning in Belgium. WE could do with some cycle lanes like that in the UK! It was such a lovely morning – something completely different to Bruges yet just on the doorstep! Joy! That opening photo is so sweet…..lovely post. Thank you Diana – it was such a lovely day out!! Great photos Joy and as usual a pleasure to read your post 🙂 As Andrew Petcher says, we could definitely do with more cycle lanes like they do in Belgium and Holland. It’s such a more environmentally friendly means to get around, so much more healthy for us and you see so much more on a bike than travelling by car! I just wish we did have cycle lanes like this in the UK!! Everywhere in Bruges the facilities for cycling were superb – wide and off the road so you could cycle safely and find it a pleasure too. If we had these available I would be on my bike most of the time, as it is we tend to stick to car free cycle trails in this country, just too frightening with a child in tow otherwise! I haven’t even done that! But now I’m going to! You definitely should!! It is a gorgeous cycle ride and so much fun. The cycling was bliss Rosemary, I never cycle with traffic, I’m just too wary but this was wonderful and we all just loved it. You should definitely try and watch the White Queen, it was great, I really enjoyed it. 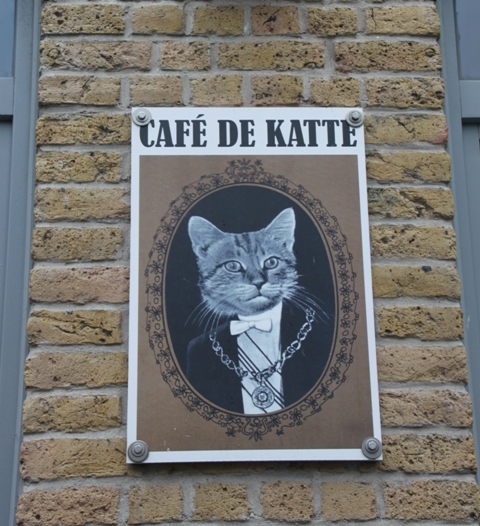 Damme was lovely, very different and much quieter than Bruges and we just couldn’t resist the kitty place!! That looks like a very scenic journey. Although I haven’t ridden a bike in a long time, even I might be tempted to cycle that route since it looks so safe and, crucially, flat. This cycle route got a huge thumbs up from me Laura!! We cycle often, sometimes what looks flat is not always the case, cue lots of puffing and huffing from me!! This was as flat as it gets and lovely views – perfection. It’s been 20 years since I last cycled (I didn’t like city cycling at all) so I might die of lack of puff even on a flat route. He he – no I promise you would have had enough puff for this!! Oh, wasn’t that the greatest bicycle path? I loved it too! Great great pictures! Thank you!! We just loved cycling here, totally safe and crucially totally flat!! Glad you loved it too. I love your photos Joy, but I especially enjoy your information as we all continue to learn as we travel through life. Thank you – I love to read other blogs too and continue that learning process!! We were spoiled with the weather actually, mainly hot and sunny every day so the rain came as a shock (although it shouldn’t have been!!). Son is growing far too quickly, I will soon be the shortest member of our family Brian!! Hope your weekend is a good one too. This place looks like a little slice of paradise. Gorgeous countryside and adirable little homes. Must go in my bucket list. Have a great weekend Joy. Isn’t it just perfect George, so unspoiled and so gorgeous. I took so many pictures of those little houses, I just loved them. We enjoyed this cycle so much – one of my top cycle trips for sure!! Enjoy your weekend too. What a wonderful day, I enjoyed your comments and I like the pictures that are not posed. Small suggestion would be that you should have a few more pictures of yourself! Looking back in the future it would be nicer. It was just the most perfect day out – simple family fun, nothing like that!! Thank you for your comments too, I tend to be the one with the camera, a bit possessive that way, so mainly not in the pictures but it is a good point!! Joy, looks like a perfect family time! When our son was young, we enjoyed biking on vacations! Looks peaceful and a safe environment for cycling! We love to get on our bikes whenever we can too Pam, a great way for our son to burn off all that excess energy for a start!! I loved cycling here though especially as cyclists are so well catered for, the most amazing traffic free cycle routes you just don’t have to worry about traffic at all. Flat too – that always works for me!! 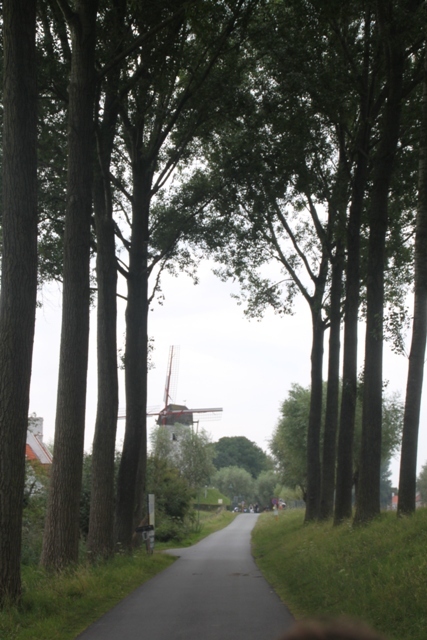 I did a bicycle tour of part of the Netherlands awhile ago and your photos made me remember all that! 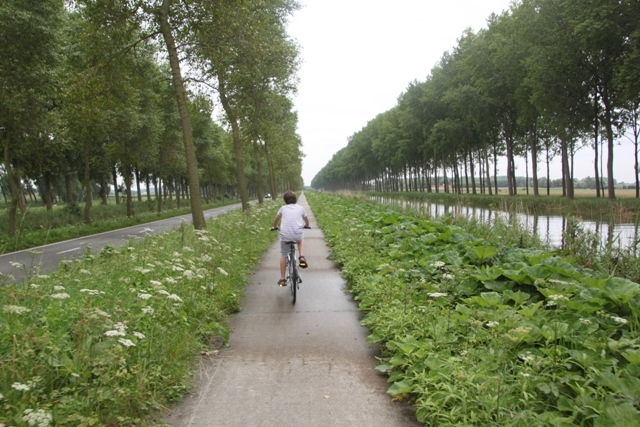 Holland and Belgium are so much more bike friendly than the USA! Your photos really capture a great outing. So much more bike friendly than the UK too – I wish we had cycle lanes like they have over there, we would be on our bikes all the time!! It was such a lovely morning, thoroughly enjoyed by all of us. What an amazing bike ride! The bike lanes look great too, not quite as terrifying as cycling on the narrow roads of the U.K.! The bike lanes were the best – I just wish we were as well sorted out here for cycling, far too terrifying here!! 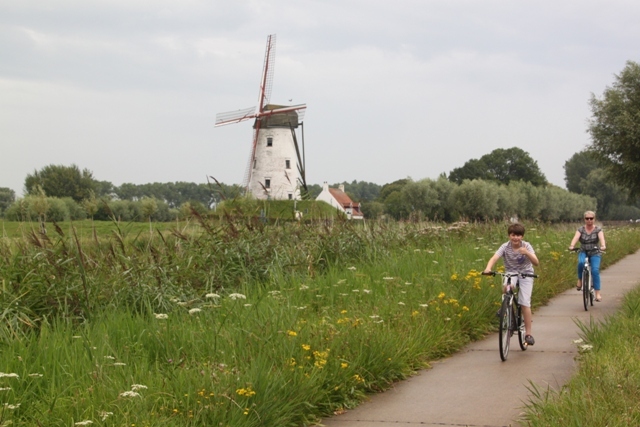 What a wonderful idea 🙂 We loved walking the paths around Bruges and seeing the windmills, but getting out and exploring on a bike would be a whole different experience. We’ve been enjoying reliving our brief time in Bruges through your posts; it was definitely one of our favorite places! Cycling was such a lot of fun, they are so well set up with all those great and safe cycle tracks. We loved doing this, felt like something completely different! 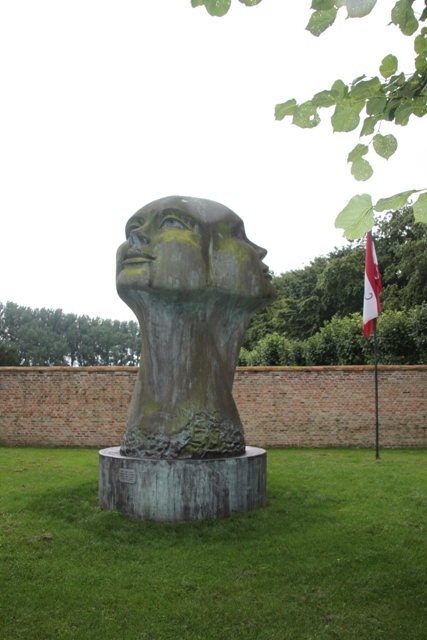 Bruges is wonderful, we loved it there too despite the rain on our last day. We always try and rent bikes when we’re away and do some kind of cycle – great fun!! Our son is more than capable of a long bike ride but that doesn’t stop him moaning and groaning!! Some terrific scenery for your last day in Bruges. I really like the photos of you and Son with the windmill, and you’ve got me curious about that BBC series. A quick question: How important is it to be able to speak French in the smaller towns in Belgium? It was a superb last day out Melissa – the cycling was great and the views were gorgeous. We were in Flanders on this trip, all Dutch speaking and absolutely no problem with English anywhere. Not so sure about the French speaking area but I’m sure you could get away with a smattering of the language. Oh! 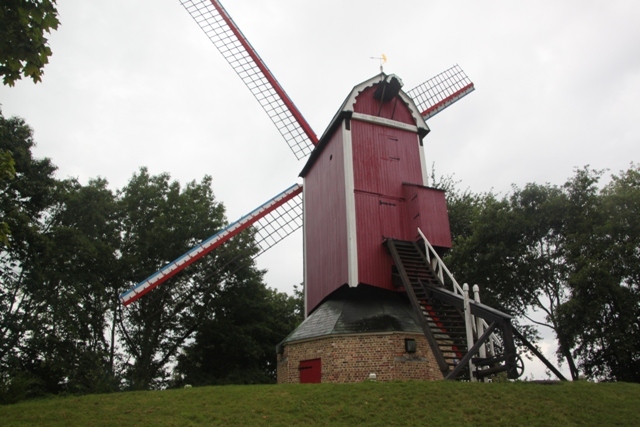 I should have known from the windmills that the area was predominantly Dutch 🙂 Thanks for the information – Belgium is definitely on my list of must-see places. A great way to see the countryside. Slow travel. Gives a different perspective. Absolutely, you get to notice the little things. This was great for that. What beautiful views and so nice to see everything from a bicycle! It was lovely Meg, loads of fun and windmills as well!! Just perfect. I love windmills! So did you go to the cat cafe? Looks like an interesting place! Me too, something about them that intrigues. We did go to the Cat Cafe, no cats there though but great food!! I was in Bruges in 2007 on a very rainy day. Wish we had a chance to take this absolutely scenic ride to Damme. Perhaps next time. Your pictures looks great! Thanks for sharing. We had a bit of rain, not too bad but still enjoyed the cycle ride! If you make it back there definitely try it out, we really enjoyed it. We love cycling too, this would be perfect for us – and being a fan of The White Queen… looks like such a scenic route. It is such a fun thing to do, the route is entirely flat – always works for me and the White Queen association with Damme is wonderful!! It was – perfect really, such a lovely place to cycle. 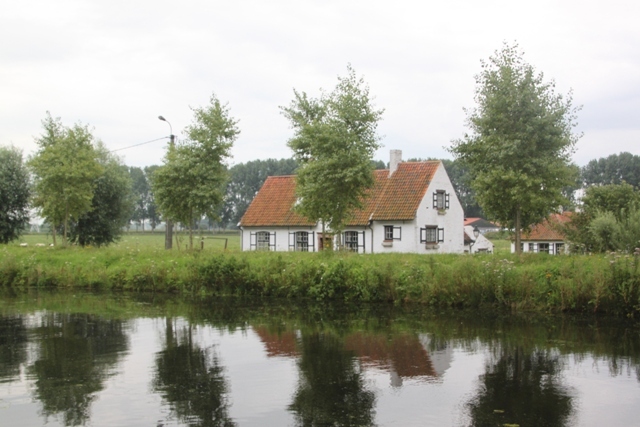 It was a lovely thing to do, it rained a bit throughout the cycle and when we were exploring Damme but it actually didn’t spoil it at all for us. If you get back there I definitely recommend it! You should definitely visit them, Belgium is such a great place and to have your very own local guides would be the icing on the cake!! What a charming town and a fun ride. I’m especially interested in that track on your first pic to roll the bike up the stairs. I’ve never seen anything like that over here. 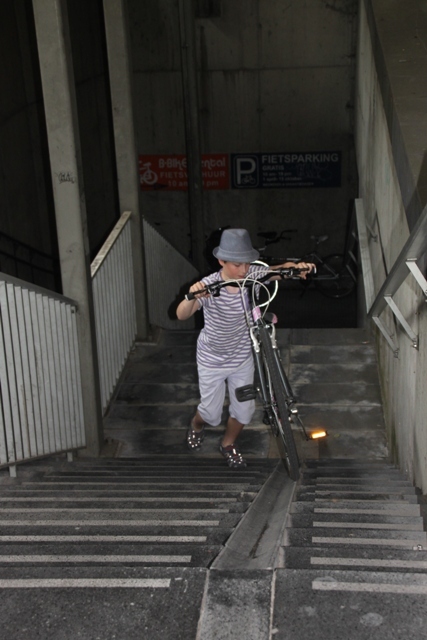 No me neither, clever way to get the bikes up, not easy but definitely easier than dragging them up all those steps!! It was – rain and all, we had the most lovely time. 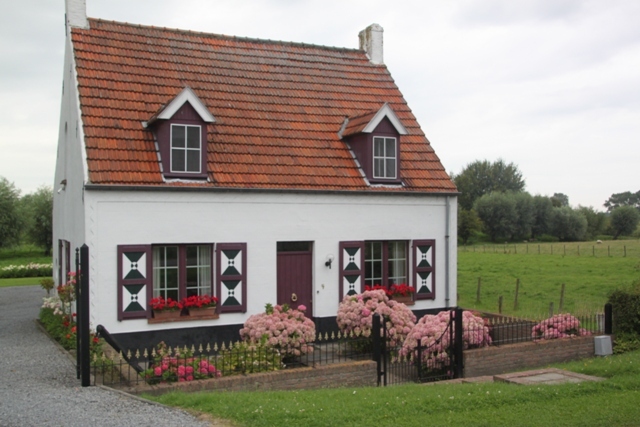 Hopefully going to get to visit Belgium this summer….Fingers crossed! Might only have 5 days though. Going to reread your blog postings, but based on your experiences any recommendations regarding cities or experiences? We loved basing ourselves in Bruges – strolling around at night when the crowds were gone was a really special experience. We also enjoyed staying in Brussels – we were only there for 1 night but again it was fun to wander especially in the evening. Ghent is a very beautiful city and we also found the World War 1 battle fields and sites fascinating but sobering. 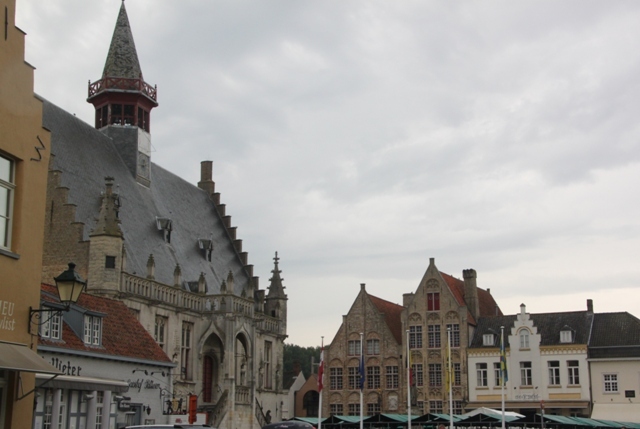 Ypres is a pretty little town with a very sad history, they have some incredible museums and if you can stay around to hear the Last Post played at the Menin Gate that is something very special. Hope you get to visit Belgium and enjoy it as much as we did!! Thanks for the reply! I’m going to keep all of this in mind as I plan…and hopefully it will all get sorted and I can go. Thanks a million!